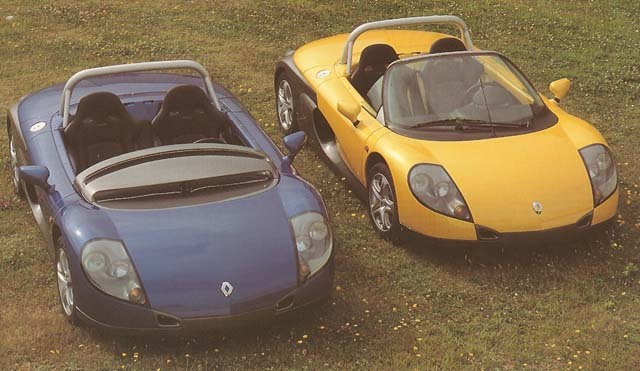 The idea for the Renault Spider was formulated in the early 1990s, in the midst of a revival, after a difficult second half of the 1980s, Renault wanted a car to promote as a sporting brand (similar to the Renault 5 Turbo from a decade earlier) as a result the Spider was the first car to be produced under the new brand name of Renault Sport or 'Renaultsport'. 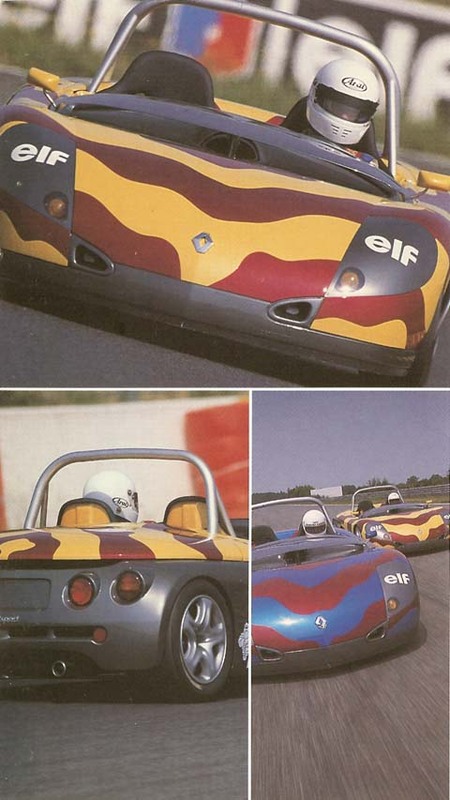 The Spider was intended to serve as both a racing car in a one-make series organized by Renault and as a slightly more civilized road car. 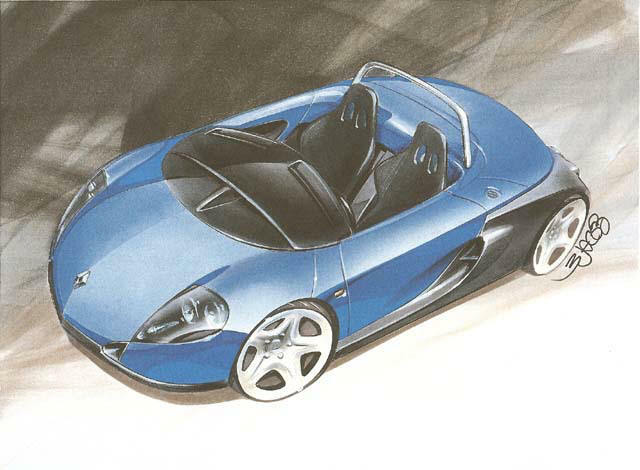 The first prototypes for Project W94, as it was known at the time, were completed in mid-1994 and a concept version was presented to the public at the Geneva Motor Show in1995. The concept featured several differences to the version that ultimately became the road car, most notably gull-wing lambo-style doors and the absence of a windscreen. The car went on sale in late 1995, assembled at the Alpine factory in Dieppe. Designed from the outset as a driver's car, the chassis was made of aluminium (combining low weight and substantial strength) clad in a GRP body. The gearbox and engine were one unit transversally fixed in an oscillating hinge (an arrangement inspired by aeronautical design), which all but eradicated the interference of engine vibration with the chassis. The pedals of the Spider were adjustable as well as the seat so the driver could achieve the absolute optimum driving position. 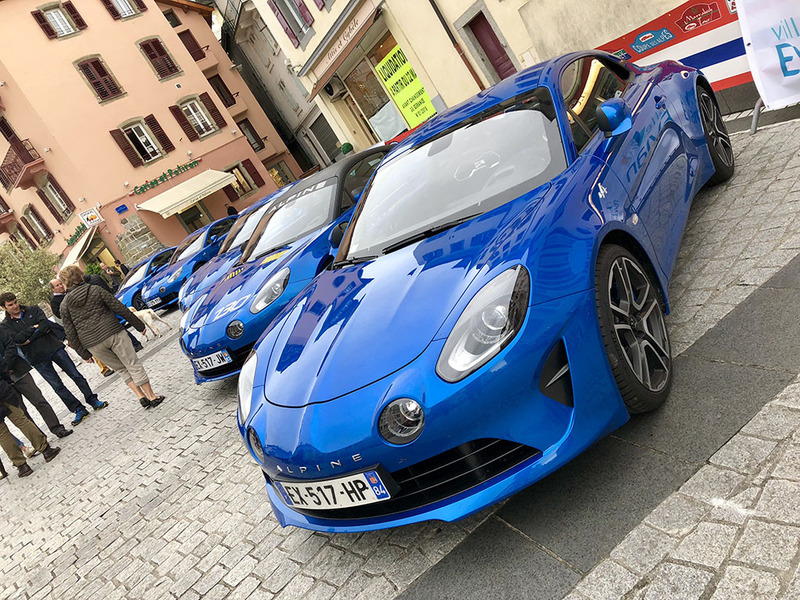 Power for the Spider came from a new version of the 2 litre engine (originally from the Renault Clio Williams) which was currently installed in the Megane 16v, producing 150 bhp with a 5 speed JC5 gearbox. 400 LHD cars were produced as “saute vente” with a wind deflector (instead of a windscreen) which created an air-screen in front of the driver. For the UK market a number of RHD cars were built with windscreens but only 60 RHD cars were sold, the remainder of the cars were sold in the German market converted back to LHD with the addition of a driver’s airbag. The car was discontinued after only a year and a half of production. As a result it is very rare and combined with it's continued desirability that makes it relatively expensive to buy second hand. 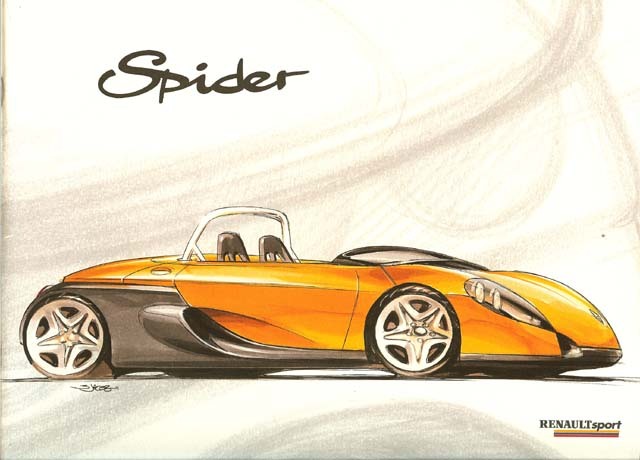 From the outset the Spider was intended as the basis for a new one-make racing series. Renault had been running these championships since the early 80s with the 5 Turbo, 21 Turbo, GTA Europa Cup and Clio models. A special Spider Trophy edition was designed and built for the purpose, with the engine now tuned to produce 180 bhp and a six speed H pattern manual gearbox. All were LHD with 99 cars produced in total. A number were imported to the UK for the one make Spider Cup series and the sister Spider Trophy series was run across continental Europe. Development of the car progressed during the series and the Trophy and Cup cars aquired subtle differences. For example the Cup car was given a larger silencer than the Trophy car and also expensive fully adjustable Penske suspension was fitted, while the Trophy cars kept their original Bilstein non-adjustable units. At the end of the first year of the series all cars were upgraded to a Sadev 6 speed sequential gearbox to replace the original H pattern box. The Spider championships ran for several years as support series to larger championships such as the British Touring Car Championship (in which it is remembered for having produced one of that series' top drivers of recent years, Jason Plato, who won 11 out of 14 races in the inaugural year of the UK Spider Cup). In 1999 Andy Priaulx beat Plato's record of eight successive race wins in the Spiders by taking a clean sweep of 13 wins in all 13 races. He also qualified for each one in pole position and took fastest laps in all but two of the events. In 1996 a variant was built by RJ racing to compete in the British GT championship and at Le Mans. It was known as the Spider Le Mans. The car was made longer, wider and with a roof but the basic Spider shape was still there. The modifications were necessary to accommodate the V6 PRV twin turbo engine in the rear (replacing the original 2 litre unit) which boasted 550 bhp with a power to weight ratio of 513 bhp per tonne. It won its first race at Donington, came 2nd at Thruxton and while leading at Snetterton retired due to mechanical failure. Due to the short space of time for preparation of the car for Le Mans unfortunately it failed to qualify and then the project was ended. A Road version of the Spider Le Mans called the Helem was produced. It is a very rare car indeed and official production numbers are not available. Please note that these are the official production numbers for vehicles built at the Dieppe Alpine factory. These figures are the combined totals for LHD and RHD cars built. Many thanks to Andy Holt.